Mother Nature sure is supplying us with cold and wind you wouldn’t believe. The weekend was miserable with rain, snow showers and that terrible wind. Was a good day to stay inside and read a book or do a puzzle. Last I heard, it’s to be nice all week with no travel issues or storms on the horizon. Hope so. If you’d like a really good meal, stop up at St. Vladimir’s Hall on Sunday, the 26th. They will be having an Ethnic Foods dinner from Noon to 5 p.m. This is eat in or take out. They hope to see you there. Good food and good company. Bob and JoAnn McGuire, Brian McGuire and Nina Weslowski attended the Eagle Court of Honor for Tyler McGuire on Saturday evening. Other relatives who also were there included Mike and Lola Mattie, Forty Fort; and Michael, Georgia and Mcguire Martin, Swoyersville. This was held at the Sweet Valley Church of Christ. Was a great and rare accomplishment as only a few Scouts achieve Eagle level. It was a nice time for all. Was a first for us, so was very interesting the path a Scout takes to become an Eagle. So proud of him and his Dad, Bob Jr. for supporting him along the way. Guess there was or is bear hunting as we saw a couple of bear check stations. Don’t know if any locals got a bear; there have been many seen, but now the season is in, they are probably hiding. Haven’t been out too much so don’t really know a lot of news. Happy Birthday wishes to Jaeden Patson, 20th; Jeff Olsen, 22nd; Serenity Laird and Reese Baton, 23rd; and Cassidy Brown, 30th. Have a nice day, all. My mind is blank, so guess that’s the news for now. Won’t be long and kids will be off for Thanksgiving. Hope you all have a Blessed Thanksgiving with family and loved ones. Take a moment to thank those who are not able to be with us as they are protecting our freedoms. 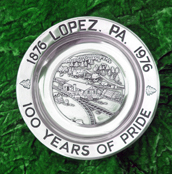 Have news give me a call at 570-928-9238; mail me; see me; or e-mail me at news@lopezpa.com. I will try my best to get it in for you. I’ll be here next time and thanks for reading.